Tottenham have announced that Seattle Sounders defender DeAndre Yedlin will join the club in January. The United States right-back, 21, signed a four-year contract with Spurs in August and has now been granted a work permit to enable him to play. "It's important for his development he's given time to adapt to his new surroundings on and off the pitch," said Spurs boss Mauricio Pochettino. "Coming to us in January it will give him the best opportunity to do so." 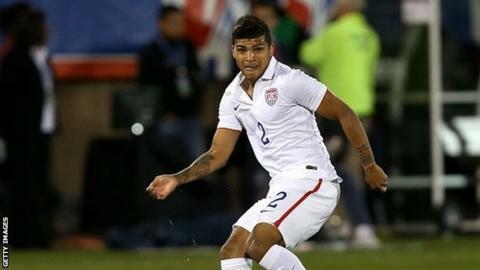 Yedlin has won 10 USA caps and made three substitute appearances during the World Cup in Brazil last summer. Pochettino added on Tottenham's website: "DeAndre is a young player with great potential who has already achieved a lot in Major League Soccer."